It's been a while, hasn't it? I recently worked out I've moved house 4 times in the last 18 months (out of the old flat, into my Mum's, into the new house, back to Mum's, back into the new house) and my life has been somewhat turned on its head. I also started a new job last January, which is still going great, if not a little exhausting trying to settle into a new work routine when your home life is in chaos. But here we are, 20 months after we got the keys to this little house. We have a new, wonderful kitchen and a new year, which I'm hoping will see a return to blogging with a little more regularity. Not that it will be hard, given the frequency that I've posted in the last 18 months. In the spirit of the new year, I wanted to start on a healthy (and health-giving) note. It hasn't been the coldest winter so far, but it has been grey and miserable. What better then, than a warming broth full of wholesome goodness? To keep the flavours light I've used a home made chicken stock with seafood and some vibrant green vegetables. Despite being a die-hard chilli addict, this time I've avoided adding chilli as the gorgeous broth-poached salmon should speak for itself. Simmer the chicken stock on low with the star anise, lemongrass, ginger, pink and white peppercorns and coriander seed for 25 minutes, then add the soy sauce. While the broth is simmering, slice the baby mushrooms in half and separate the pak choi leaves from the lighter base. Next, poach the salmon in the broth for 5 minutes before removing and setting aside to cool. Flake the salmon and leave aside for the time being, then sieve the broth into a new pan, making sure to catch the broth components in the sieve - discard these. Add the noodles to the clear broth pan and simmer for 5 minutes, then add in the light pak choi stem, mushrooms and sugar snaps. After a further couple of minutes, chuck in the prawns, scallops and pak choi leaves and simmer for a final two minutes. 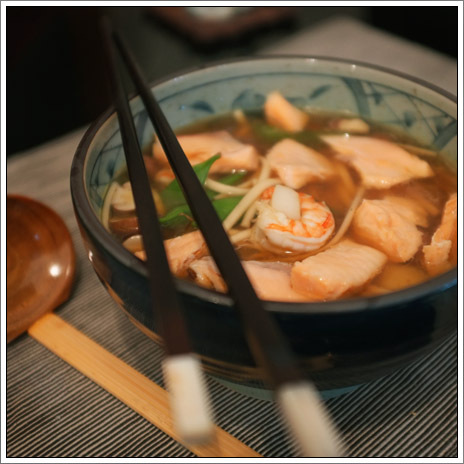 Spoon the soup into two bowls, scattering the flaked salmon on top and enjoy. Perfect healthy, warming soup for a cold winter's evening.